Always wanted the reliability and fun of a Miata but didn't care for the styling or naturally aspirated of one in stock form? If so, this 2000 Mazda MX-5 Miata fitted with an aftermarket body and supercharged engine could be the small roadster of your dreams. Ever since its introduction in 1989, the Miata has been popular as a relatively inexpensive two seat sports car. Currently in its third generation the small cars have developed a cult following of devotees and is well appreciated in its stock form. In 2000, the Guinness Book of World Records officially declared the Miata to be the best-selling two-seat convertible sports car in history. When any car model becomes as popular it is an inevitability that someone will try and improve upon it (Think Volkswagen based kit cars). Often times these improvements don't turn out well, ending up painful to look at or detracting from what made the initial model popular (Again, Volkswagen based kit cars). This particular Miata, currently listed on Ebay, has been re-bodied with a custom made body kit. Although the result isn't for everyone, we can't imagine anyone has described it as painful to look at. 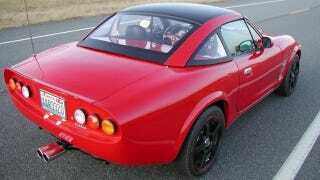 What started out as a 2000 Mazda Miata MX5 show car was fitted with a Simpson Design Italia 2 body and a variety of other improvements during its transformation into what the seller calls "The first production Italia 2". This example is actually the second car built with the Italia 2 kit and is currently being sold by the owner of Simpson Designs, who produce the body kit. "in the spirit of the small Italian coach builders of the 50's and 60's who became famous for building swoopy small cars on mostly Fiat platforms, the Italia 2 utilizes one of the best and most reliable sports car platforms of all time to create a modern coach built sports car with timeless looks." Although the result is absolutely a swoopy small car, we aren't sure we would describe its looks as "timeless". The Italia 2 kit saves a negligible amount of weight over stock and certainly makes this Miata stick out from the over 900,000 others that were produced. With what basically amounts to a stock Miata underneath combined with a supercharger it isn't hard to imagine the Italia 2 would be a lot of fun to drive. If you were to assess the Italia 2 based on content, you might think that this car had hit the mark all other body kits and kit cars aspire to. Depending on your individual taste, you might be right, until you got to the price. While the reserve is not revealed, the owned simply explains in the listing "it is high". According to the Simpson Designs website, the Italia 2 kit will cost you $9,900 if you want to transform your Miata yourself. If you want Simpson Designs to install the kit you can add another $5000. Although we don't know what the exact reserve of the Italia 2 is on Ebay, the car is currently listed with a $35,000 asking price on the Simpson Design website. The owner claims to have over $70,000 in the cars construction. Regardless of our positive or negative feelings about the design of the Italia 2, at that price we doubt it will ever be referred to as a relatively inexpensive two seat sports car again.